Global angiography equipment market expected to generate revenue of around USD 13 billion by 2024, growing at a CAGR of around 5.50% between 2018 and 2024. Angiography is used to make an image of blood vessels, such as the heart, head, kidneys, or lungs. Contrast medium is inserted into the artery so that the blood vessels can be examined. The report covers a forecast and an analysis of the angiography equipment market on a global and regional level. The study provides historical data for 2015, 2016, and 2017 along with a forecast from 2018 to 2024 based on revenue (USD Billion). 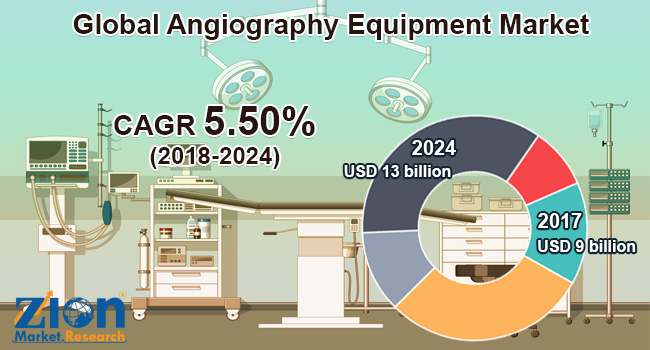 The study includes the drivers and restraints for the angiography equipment market along with the impact they have on the demand over the forecast period. Additionally, the report includes the study of opportunities available in the angiography equipment market on a global level. In order to give the users of this report a comprehensive view of the angiography equipment market, we have included a competitive landscape and an analysis of Porter’s Five Forces model for the market. The study encompasses a market attractiveness analysis, where product, technology, procedure, indication, application, end-user, and regional segmentation are benchmarked based on their market size, growth rate, and general attractiveness. The report provides a company-wise market share analysis to give a broader overview of the key market players. In addition, the report also covers key strategic developments of the market including acquisitions & mergers, new product launch, agreements, partnerships, collaborations & joint ventures, research& development, and regional expansion of major participants involved in the market on a global and regional basis. The study provides a decisive view of the angiography equipment market by segmenting the market based on product, technology, procedure, indication, application, end-user, and region. All the segments have been analyzed based on present and future trends and the market estimated from 2018 to 2024. By product, the angiography equipment market is segmented into angiography systems, catheters, guide wire, balloons, contrast media, vascular closure devices (VCDs), and angiography accessories. By technology, the market is segmented into X-Ray, CT, MRA, and other angiography technologies. By procedure, the market is segmented into coronary angiography, endovascular angiography, Neuroangiography, Onco-angiography, and other angiography procedures. By indication, the market is segmented into coronary artery disease, valvular heart disease, congenital heart disease, congestive heart failure, and other indications. By application, angiography equipment market is bifurcated into diagnostic and therapeutic. By end-user, the angiography equipment market includes hospitals and clinics, diagnostic and imaging centers, and research institutes. The worldwide growth in geriatric population and increasing incidences of cardiovascular diseases coupled with the growing demand for interventional angiography systems in minimally invasive surgeries and awareness programs, conferences, and funding activities for angiography equipment are major growth factors of the angiography equipment market. Reimbursement policies for angiography procedures and the risk of radiation exposure might hinder this market during the forecast time period. The regional segmentation includes the current and forecast demand for North America, Europe, Asia Pacific, Latin America, and the Middle East & Africa with its further division into major countries including the U.S., Germany, Italy, France, UK, China, Japan, India, and Brazil. Some key players operating in the global angiography equipment market include GE Healthcare, Koninklijke Philips N.V., Siemens Healthineers, Canon Incorporation, Shimadzu Corporation, Boston Scientific Corporation, Cordis Corporation, Medtronic, Inc., AngioDynamics, Inc., B. Braun Melsungen AG, and Abbott Laboratories, among others.